Sockeye salmon – sometimes referred to as "red" salmon – and pink salmon are both cold water fish found in the Pacific Ocean. Unlike Atlantic salmon, Pacific salmon are caught wild in rivers, lakes and estuaries from Oregon to Alaska. All species of Pacific salmon are anadromous, meaning that they live in the ocean but enter fresh water sources to spawn. Both red salmon and pink salmon are available canned, but are also frequently sold as frozen fillets or steaks or smoked, and fresh during certain times of the year. Sockeye salmon, Oncorhynchus nerka, is one of the species of salmon found in the Pacific Ocean that belongs to the genus Oncorhynchus. Sockeye salmon are commonly known as “red salmon” because as they return upriver to their spawning grounds, the fish change from a metallic, bluish color to brilliant red. Sockeye are a small species of salmon, weighing approximately 6 pounds. Sockeye salmon are the most economically important – although not the most abundantly caught – species of salmon in Alaska due to their rich, full flavor and firm texture. Pink salmon, Oncorhynchus gorbuscha, is also of the genus Oncorhynchus and is found in the Pacific Ocean. Pink salmon have the distinction of being the smallest of the Pacific salmon, averaging only about 4 pounds. They have the other distinction of being the most abundant Pacific salmon – more are taken by commercial fishermen than any other salmon species. Pink salmon have light pink flesh, a mild flavor and a lower oil content than Sockeye salmon. They are not considered as high a quality of fish as Sockeye salmon, but are a good, affordable option. Sockeye salmon is sold fresh or frozen, smoked, or canned as “red” salmon. The Sockeye salmon from the Copper River in Alaska, Copper River Reds, are considered some of the best-tasting salmon – their high fat content makes them rich and delicious, and they’re eagerly awaited each year during the short window of time they’re available fresh. Pink salmon, being less rich, is a milder-tasting, paler fish. It’s most often canned, but also sold fresh or frozen. 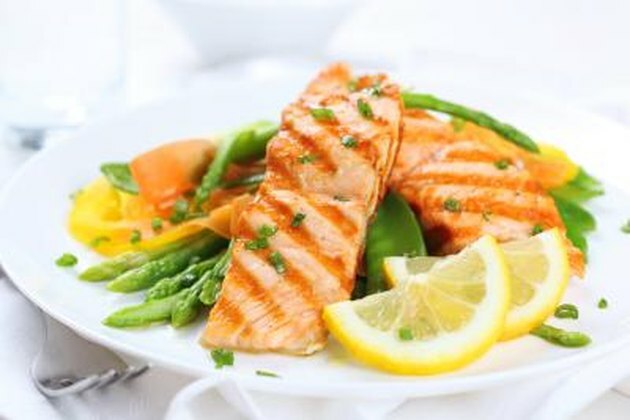 Sockeye salmon’s taste is so flavorful and rich that it can be the showcase of a meal – take advantage of its flavor and prepare it simply, served with lemon wedges on the side. Grilling, broiling, pan-frying or roasting are all good options for Sockeye salmon fillets or steaks. Use canned red salmon in lightly dressed salads or delicate chowders, where its flavor can come through. Pink salmon is best used in recipes where the color and flavor isn’t as important; use it in soups, casseroles and sandwich spreads, for example. Nutritionally, Sockeye salmon and Pink salmon are similar. Both are rich in the healthy omega-3 fatty acids that play a crucial role in brain function – possibly warding off depression – as well as cardiovascular health. Per 3.5-oz. serving, Sockeye salmon has 167 calories, 21 grams protein, 9 grams fat and 62 mg cholesterol. Pink salmon, per 3.5-oz. serving, has 153 calories, 26 grams protein, 5 grams fat and 94 mg cholesterol.